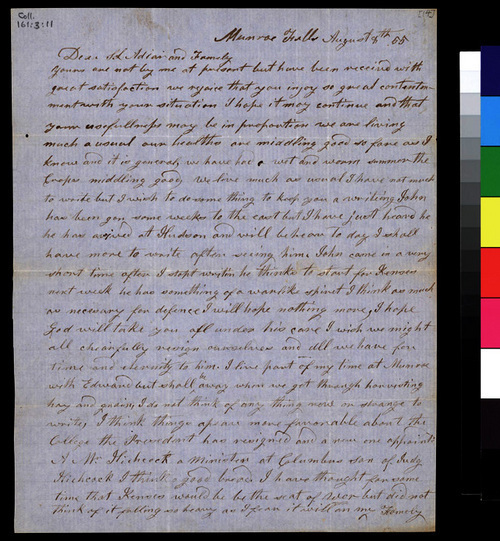 Owen Brown wrote from Munroe Falls, Ohio, to Samuel and Florella Adair in Osawatomie, Kansas Territory, that his son, John Brown, would start for Kansas Territory in a week. Florella Brown Adair was a half sister of John Brown. Owen explained some of his religious beliefs, and mentioned that John had a "warlike spirit," which was necessary for defense, but that Owen hoped it would not extend beyond defense. The letter contained a postscript written by John Brown.